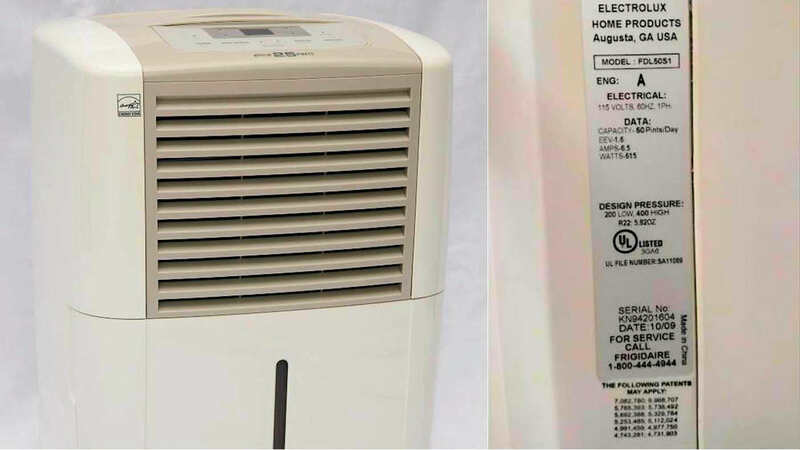 NEW YORK -- The Consumer Product Safety Commission on Wednesday announced a recall of about 3.4 million dehumidifiers in the US made by Midea and sold at Lowes, Menards, PC Richard from 2003 through 2013. The dehumidifiers can overheat, smoke and catch fire, posing serious fire and burn hazards. Officials say Midea has received 38 reports of smoke and fire, and about $4.8 million in property damage has been reported. Consumers should immediately turn off and unplug the dehumidifiers and contact Midea for either a replacement unit or a partial refund. Consumers whose dehumidifiers were manufactured before October 1, 2008 will receive a partial refund, not a replacement. The manufacturing dates can be found on back of units. To contact Midea, call 800-600-3055 from 7 a.m. to 6 p.m. Central Time Monday through Friday or online at Midea.com/us/ and click on "Product Recall" for more information. The recall involves 25, 30, 40, 50, 60, 65, 70, and 75-pint dehumidifiers with the following brand names: Airworks, Alen, Arcticaire, Arctic King, Beaumark, Coolworks, ComfortAire, Comfort Star, Continental Electic, Crosley, Daewoo, Danby, Danby & Designer, Dayton, Degree, Diplomat, Edgestar, Excell, Fellini, Forest Air, Frigidaire, GE, Grunaire, Hanover, Honeywell, Homestyles, Hyundai, Ideal Air, Kenmore, Keystone, Kul, Midea, Nantucket, Ocean Breeze, Pelonis, Perfect Aire, Perfect Home, Polar Wind, Premiere, Professional Series, Royal Sovereign, Simplicity, Sunbeam, SPT, Sylvania, TGM, Touch Point, Trutemp, Uberhaus, Westpointe, Winix, and Winixl. The brand name, model number, pint capacity and manufacture date are printed on the nameplate sticker on the back of the dehumidifier. To determine if your dehumidifier has been recalled, enter the model number at Recallrtr.com/dehumidifier.